A view of the Hossainabad Garden, [Lucknow]. bl.uk > Online Gallery Home	> Online exhibitions	> Asia, Pacific and Africa Collections	> A view of the Hossainabad Garden, [Lucknow]. 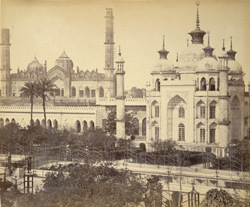 Photograph of the Hussainabad Imambara from the Vibart Collection: 'Dannenberg Album' of Indian Mutiny sites taken by an unknown photographer in the 1870s. The Husainabad Imambara or Chhota Imambara, constructed during the reign of Nawab Muhammad Ali Shah of Awadh (r.1837-1842), was a building used to celebrate the festival of Muharram. This complex of the Husainabad Imambara is rectangular and can be entered through four impressive gateways on each side. The complex consists of a forecourt and main court. The imambara is located within the main court and has a mosque on one side and a Taj-replica tomb on the other. This view shows the Taj-replica tomb and the Jami Masjid in the distance.